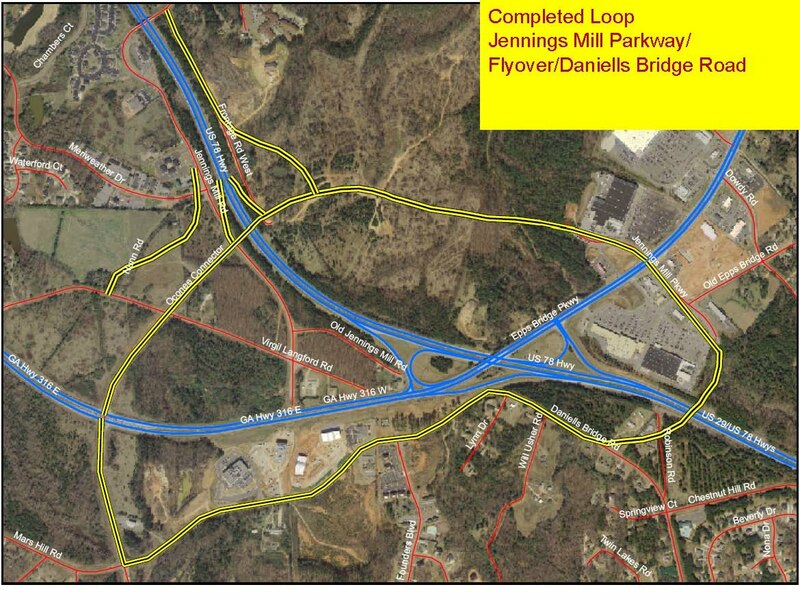 The liquor-by-the-drink referendum had been anticipated, but the inclusion of the agenda of the controversial flyover of SR Loop 10 to create a commercial loop connecting to Daniells Bridge Road had not. That project officially is listed as “Long Range,” but behind-the-scenes negotiations by the county have resulted in the contract before the BOC Tuesday night that calls for approval of a concept plan in May of 2015 and authorization of construction funds in August of 2018. The BOC meeting, which is to begin at 7 p.m. in the courthouse in Watkinsville, could be a lengthy one, depending largely on how many people want to express an opinion on the liquor-by-the-drink referendum. County Attorney Daniel Haygood is scheduled to introduce discussion of a referendum for the November ballot for “sales of distilled spirits by the drink in restaurants only” as the seventh item on the 21-item agenda. The county, on its agenda web page, has released no information on what Haygood will propose. Voters in Oconee County most recently voted on the issue in November of 2002, when just fewer than 55 percent of the voters rejected the option. They turned down similar referendums in 1996 and 1990. In 2008, the Board of Commissioners approved the sale of beer and wine in restaurants, as it is allowed to do without seeking voter input. It cannot approve alcohol sales without a referendum. Pressure for the referendum is coming from Epps Bridge Centre developer Frank Bishop, the Oconee County Chamber of Commerce, and the county’s Industrial Development Authority. Both the Chamber and the IDA, the majority of whose members are appointed by the BOC, said it was not taking a stand on liquor-by-the-drink but only on whether it should go on the ballot. Bishop clearly called for passage of the referendum. The IDA argued the issue should be on the ballot to support restaurant development, which is also what Bishop has said is his rationale. No one will get any benefit unless the issue passes, contradicting the IDA argument that it was only supporting the referendum and not a specific outcome. So far, no organized opposition to the referendum has surfaced. BOC Chairman Melvin Davis is bringing to the BOC for approval three Project Framework Agreements between the county and the Georgia Department of Transportation. One is a $21.7 million reconstruction of Jimmy Daniell Road, another is a $3.9 million widening of Daniells Bridge Road, and the third is the $4.9 million extension of Daniells Bridge Road and flyover of SR Loop 10. In each case, the county is being asked to agree to timelines and to its contribution of monies for the projects. The county would contribute 5 percent of the funding for the Jimmy Daniell Road construction, 76 percent of the funding for the Daniells Bridge Road widening, and 6 percent of the funding for the Daniells Bridge Road extension and flyover. State and federal monies would be used for the remainder of each of the projects. The Daniells Bridge Road extension and flyover have been opposed by residents of nearby subdivisions in the past, with much of the vocal opposition coming from Welbrook Farms subdivision, in which I reside. In 2011, the Board of Commissioners eliminated the Daniells Bridge Road extension and flyover from the list of projects that the county would include on the 2012 Transportation Special Purpose Local Option Sales Tax referendum in response to citizen complaints. That tax ultimately was turned down. Bob Isaac, a resident of Welbrook Farms and member of the county’s Citizen Advisory Committee on Land Use and Transportation Planning, has continued to voice his opposition to the project at meetings of that group. The updated timetable and funding formula that will be before the BOC on Tuesday night has never been presented to the Citizen Advisory Committee. Sherry McDuffie, a transportation planner with Madison Athens-Clarke Oconee Regional Transportation Study (MACORTS), told me on Friday that she is well aware of the opposition to this project. McDuffie told me that the construction timetable for the project remains “Long Range” in MACORTS documents. The project is listed that way on the MACORTS web site in the FY2015-2018 Transportation Improvement Program document drafted on June 25, 2014. The diagram of the project at the top of this post is from the June 25 report. McDuffie also told me that timetables change when local officials negotiate with GDOT on their own priorities. She told me she was aware changes were being negotiated for the two Daniells Bridge Road projects, but she had not been informed of the details of the timetable before the BOC on Tuesday evening. GDOT sent Oconee County BOC Chairman Davis two separate letters on July 3 informing him of the new project timetable. The widening of Daniells Bridge Road also is listed as “Long Range” in the MACORTS documents. 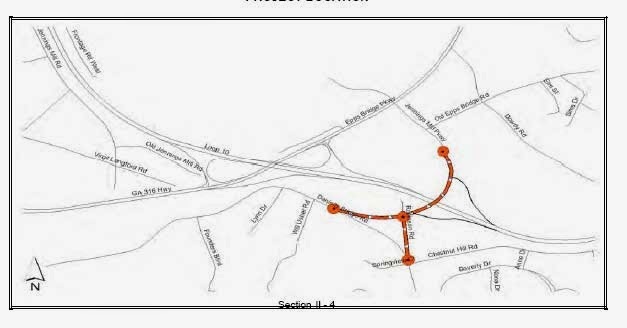 Those documents also indicate that the widening will be only from just south of Chestnut Hill Road to Hog Mountain Road. The GDOT letter of July 3, 2014, to Davis states that the project involves construction of turn lanes on Daniells Bridge Road all the way from Mars Hill Road to Hog Mountain Road. The county already has installed turn lanes on Daniells Bridge Road from Mars Hill Road to Founders Boulevard. Emil Beshara, director of public works for the county, has said in the past it will be possible to make Daniells Bridge Road three lanes through the blind curve on the roadway as it abuts the entranceway to SR Loop 10 from SR 316, but not wider without taking additional right-of-way. The Daniells Bridge Road Extension would connect to the existing Daniells Bridge Road just east of this blind section of the roadway, putting additional traffic on the roadway. The Daniells Bridge Road Extension itself, according to the MACORTS documents, will be four lanes wide with a raised median. It also could include entrance and exit ramps from SR Loop 10 at the flyover. According to the MACORTS draft document of June 25, the Jimmy Daniell Road project involves the widening and reconstruction of Jimmy Daniel Road to four lanes with additional turn lanes as needed from SR 316 to the Atlanta Highway. The letter sent to BOC Chairman Davis, dated July 9, provides no detail on the project. The road name is hand-written on the document, which initially referred to the Daniells Bridge Road Extension. The cost of living adjustment for the county’s 78 retirees became controversial at the June 3 meeting of the BOC when Chairman Davis acknowledged, in response to prodding from Commissioner Jim Luke, that Davis had inserted the funding for the increase in the county’s Fiscal Year 2015 budget without informing or consulting with the other four commissioners. The other four commissioners probably would never have known that the budget included the money except for the realization on the part of county Finance Director Wes Geddings that the county could not make the allocation without changing the Defined Benefit Plan. That change will require a vote of the BOC, and that is what is being requested of it on Tuesday night. The BOC is being asked to approve a one-time payment to retirees or their beneficiaries who are currently receiving benefits under the existing plan that is equal to 3 percent of each individual’s annual benefit. The 2015 budget also includes a 3 percent COLA for existing employees. The state let bids on July 18 for widening of Mars Hill Road from SR 316 to Butler’s Crossing. Included is 3.3 miles of roadway and new bridges over Barber Creek. The state has received four bids, ranging in price from $26.4 million to $31.5 million. G.P.’s Enterprises Inc. of Auburn ($26.4 million), C.W. Matthews Contracting Co. Inc. of Winterville ($29.5 million), E.R. Snell Contractor Inc. of Snellville ($30.8 million), and CMES Inc. of Lilburn ($31.5 million). County Administrative Officer Jeff Benko is scheduled to give the update on the project, which is expected to take three years to complete and will divert traffic onto Daniells Bridge Road, long before the proposed widening of Daniells Bridge Road takes place.